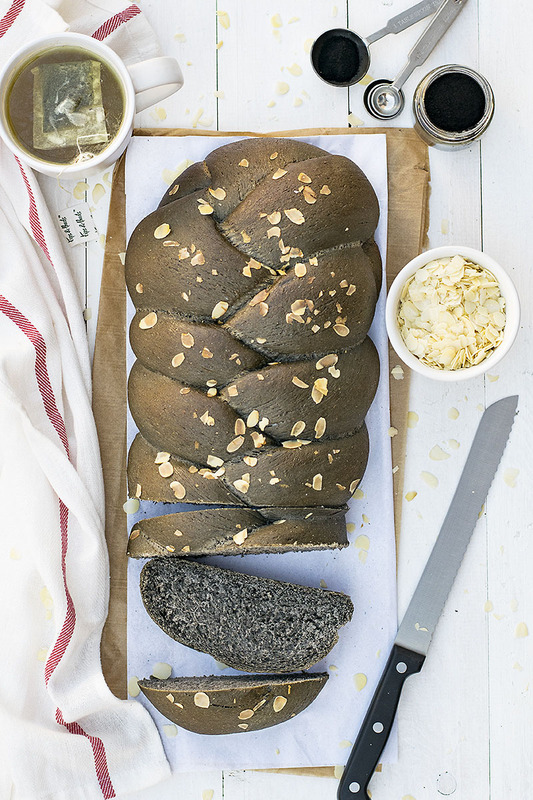 Make this detox vegan Challah bread even if you don’t have activated charcoal! It has olive oil, it’s healthy, easy, and delicious! 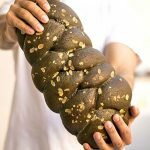 This black detox vegan Challah bread is your healthy option for when you crave something sweet, fluffy and delicious! 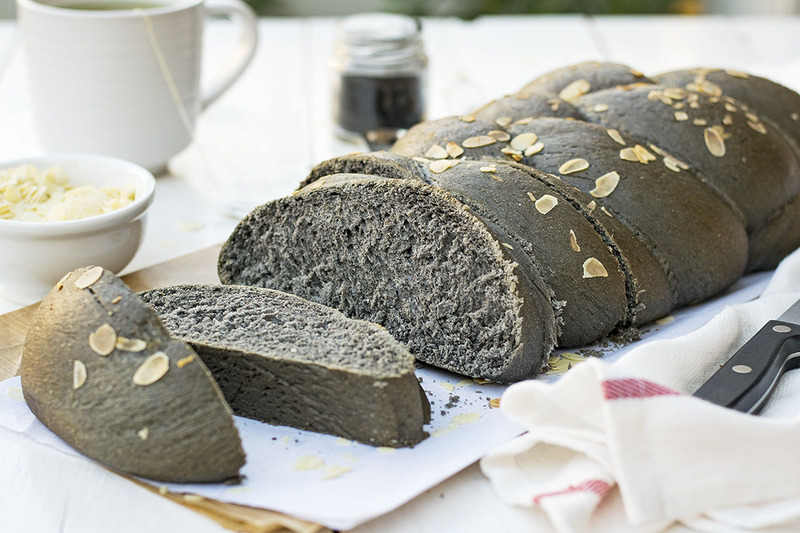 Olive oil makes this bread very soft, moist, and healthy, and the addition of activated charcoal gives it a nice black (or almost black) color. Besides the color, activated charcoal has the ability to remove the toxins from our body (which, after all, is the main reason it is used in this recipe). Luckily, it doesn’t impart any flavor to the challah, so all the other spices and aromatics used have plenty of room to shine. And they do shine! 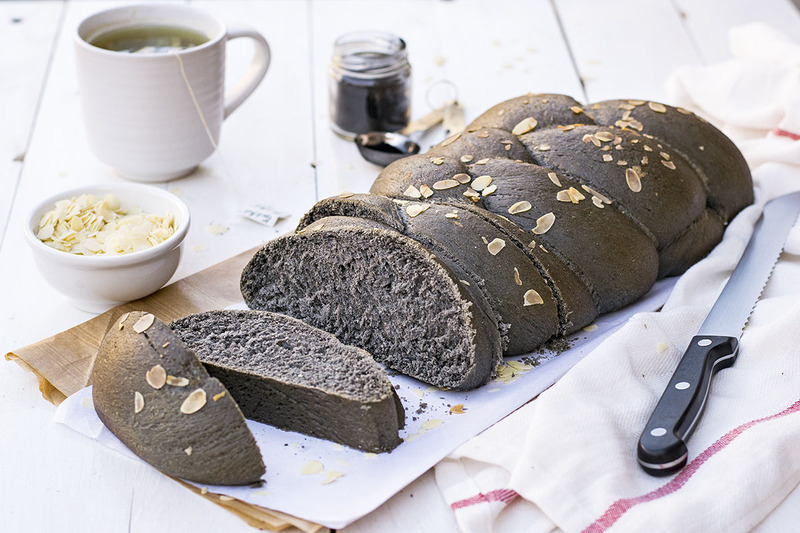 So, make this bread even if you don’t have any activated charcoal! It will become one of your favorite treats! This detox Challah bread is vegan because it doesn’t contain any butter or eggs and it’s also refined sugar-free because it is sweetened with maple syrup (though you can also use others sweeteners of your choice – more about this at the end of the post). To get some extra fiber, about half of the flour is whole wheat flour and the rest is bread flour which helps to achieve the right texture. 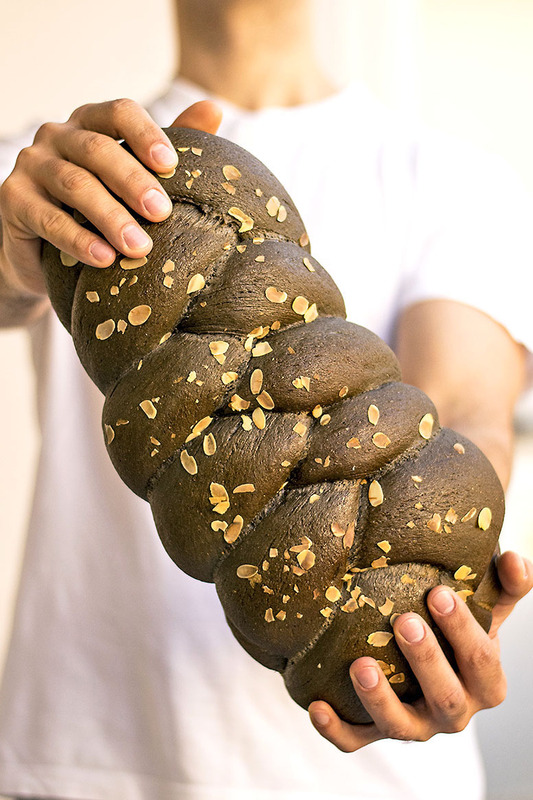 For all these reasons this Challah is something you can eat throughout the day, either for breakfast or for a healthy snack. Sometimes I eat this bread in the afternoon with a nice cup of tea and a piece of dark chocolate and other times I eat it for breakfast with a glass of milk. And because of the olive oil, if you store it well-sealed inside a ziplock bag, it will keep for at least 4-5 days at room temperature and some more if refrigerated. The majority of edible activated charcoal comes from coconut husks which are processed in a certain way to become very porous. When activated charcoal is ingested, many toxins and other harmful substances are easily trapped in its’ tiny pores and flushed out from our body. This is why it is perfect for digestive cleanse and for removing toxins that cause allergic reactions, oxidative damage and poor immune system function. It also alleviates uncomfortable gas and bloating by binding the gas-causing byproducts in foods that cause discomfort. For more benefits of activated charcoal see what Dr.Axe says. If you’re on a detox kinda phase right now, you may want to check this baked chickpeas (revithada) recipe, these meatless Greek stuffed vegetables or just visit the Extra Healthy category of this blog! Substitute grape syrup for maple syrup. You can also use honey if you’re not vegan. 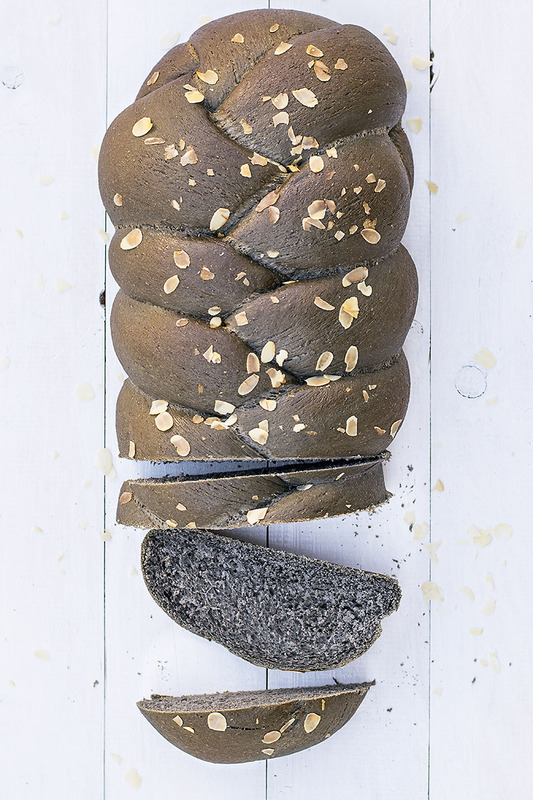 You can make this bread even if you don’t have activated charcoal. The olive oil and the spices used in the recipe, they too have some detox properties. However, if you want the color to be dark you can replace 3-4 tablespoons flour with equal amounts of carob flour. Carob flour is a healthy flour with chocolaty flavor and I’ve used it in this carob and whole wheat bread with walnuts with great success! As with (almost) all bread doughs, kneading it for a LONG time ensures great texture. A stand mixer is ideal for this job! Try to find a finely ground whole wheat flour for the best texture possible! If you’re on any kind of medication, have a talk with your doctor first! And remember not to take activated charcoal within 90 minutes to 2 hours of taking any prescription medication or supplements as it can prevent proper absorption. Mix 1 cup of the flour and the dry yeast in the bowl of your stand mixer, add the water (it should be the temperature of your body) and stir well. Let it sit for 5 minutes for the yeast to activate. In another bowl combine the remaining flours, the spices, the activated charcoal and the salt. Add them to the bowl of your mixer following by the olive oil, maple syrup, and the vanilla and knead with the hook attachment for at least 15 minutes. The dough should be elastic and slightly sticky. If it’s too soft, add some more flour, 1 tablespoon at a time. Cover the bowl with a towel and let it rise in a warm place until double in volume (1-2 hours). Knead again for 5 minutes, transfer the dough to your work surface and cut it into three equal pieces. Roll each piece into a braid and form the bread. Transfer to a baking pan lined with baking paper and let it rise in a warm place until almost double in volume (about 1-2 hours). Transfer the ingredients for the glaze in a small glass and mix well with a fork. Brush the challah with the glaze and sprinkle with the sliced almonds. Bake for 35 – 40 minutes. Transfer to a rack to cool. You can cut the dough into 6 equal pieces and make 2 smaller loaves. In this case, you’ll bake them for about 30 minutes. What an interesting post Makos! In fact, I was researching activated charcoal lately, the texture and the colors looks amazing. Thanks for sharing this awesome post…! Great minds think alike, haha! Thanks!!! This looks and sounds amazing, I love your photos. I’ve never tried this type of bread with or without charcoal so I’m very intrigued. Now I just have to work out where I can buy this charcoal locally. Do you thick it would be available at a health food shop? Now I’m going to check your baked chickpea recipe, you hooked me in! Thank you very much Kay! You can definitely find activated charcoal on amazon or ebay… I bought mine from a health food shop, and a friend of mine found some from a cosmetics store (it is also used in face masks!). Just make sure it is 100% natural (usually it is made from coconut husks). might have read this as botox instead of black detox bread! whoops. anyways, this looks like such an awesome loaf. charcoal is so big in southern california right now, and i see it everywhere from charcoal lemon water to charcoal soft serve! Thank you very much Heather!